WEAPON BRAINs feature interchangeable lens mounts—supporting a wide range of lens options including: PL, Canon, Nikon, and Leica-M. The DSMC VV Mg PL Mount 2.0 (Captive) allows you to use full frame PL mount cinema lenses with your WEAPON 8K VV BRAIN. The DSMC S35 Mg PL Mount 2.0 allows you to use PL mount cinema lenses with your DSMC or DSMC2 BRAIN. The DSMC S35 Canon Mount offers support for a wide variety of Canon EF and EF-S compatible lenses to use with your DSMC or DSMC2 BRAIN. The DSMC S35 Nikon Mount enables you to equip a wide variety of Nikkor AF-S and AF-D compatible lenses to your DSMC or DSMC2 BRAIN. The DSMC VV Al Canon Mount offers support for a wide variety of Canon EF-S and full frame Canon EF compatible lenses to use with your WEAPON 8K VV BRAIN. The DSMC Al Leica-M Mount allows you to mount a select group of Leica-M lenses onto a DSMC or DSMC2 BRAIN for shooting motion or still images. RED BRAINs are modular. Choose an expander with output options, and a power solution that best fits your needs. Designed for professional shooting configurations, the DSMC2 Production Module (V-Lock) mounts directly to the BRAIN and offers a comprehensive array of video, power, communication, and pro audio connections. 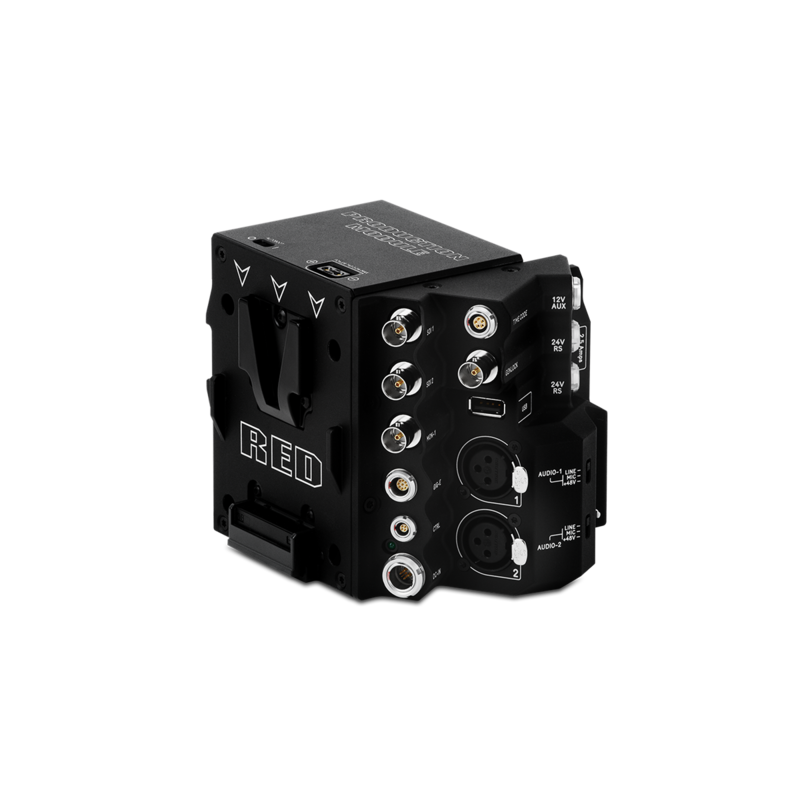 The DSMC2 Jetpack-SDI Expander is designed for aerial, gimbal, handheld, and other lightweight/remote applications that require 3G-SDI output. The DSMC2 Gold Mount Battery Module Pro is a low profile cable-free module that enables power to your DSMC2 BRAIN and accessories using standard Gold Mount batteries. The DSMC2 Base Expander is an ideal connector module for the general user’s Input/Output (I/O) needs. Machined from robust 7075 Aluminum, the DSMC2 Tactical Top Plate mounts to the top of your DSMC2 BRAIN to provide 1/4-20 and 3/8-16 mounting points for RED and third-party accessories. The DSMC2 V-Lock Battery Module Pro is a low profile cable-free module that enables you to power your DSMC2 BRAIN and camera accessories using standard V-Lock batteries. RED MINI-MAG SSD media introduces speed and stability previously unseen with most media systems, with storage capacities of 120GB, 240GB, 480GB and 960GB. 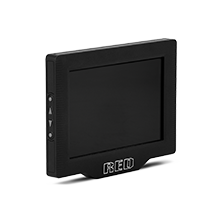 The RED MINI-MAG is the smallest, fastest, and most powerful media option with faster read/write speeds to support higher frame rates and resolutions with minimal compression. Comes in 120GB, 240GB, 480GB and 960GB models. The RED STATION RED MINI-MAG - USB 3.1 is designed exclusively for offloading data from RED MINI-MAG media to your workstation. The RED MINI-MAG (4-Pack) offers 4x ultra-fast RED MINI-MAGs and a water-resistant case lined with precision-cut foam for protection during transportation. Turbo-charged RED MINI-MAG red models deliver thelargeststorage capacities with a max data rate of 300 MB/s for achieving the lowest REDCODE® compression ratios. RED provides a variety of power options in the form of REDVOLT, REDVOLT XL, REDVOLT-V and REDBRICK batteries. Designed to fit with the profile of a DSMC2 camera body, the REDVOLT-V is the ideal battery for the filmmaker on the go and for use in gimbal and drone configurations. RED BRICKs provide long term power for your RED ONE, DSMC, or DSMC2 camera in the form of a 153WH V-Mount battery. The RED BRICK Charger is portable and lightweight, allowing you to sequentially charge 2x RED BRICK or REDVOLT-V batteries anywhere there is a standard power outlet. Touch screen capable LCD panels have been developed for RED BRAINs that innovate the way you navigate menus and monitor in the field. Even in direct sunlight, The DSMC2 Touch 7.0 Ultra-Brite LCD provides a higher-definition HD viewing experience when shooting and playing back footage. The RED Pro Touch 7.0" LCD offers a high-definition viewing experience for recording and viewing footage on your DSMC or DSMC2 camera system. The DSMC2 RED EVF (OLED) is a high definition electronic viewfinder designed as the ideal single-viewer monitoring solution. Find the neccessary rigging components to adapt your camera rig to any style of shooting. The DSMC2 Side Handle offers the most ergonomic handle option—complete with navigation wheel and customizable settings to control menu functions. The DSMC2 Outrigger Handle offers a low profile side handle—designed with an ergonomic molded grip and integrated Record Start/Stop button. The DSMC2 Sidekick™ is a lightweight interface solution that offers intuitive and integrated control over critical camera parameters.